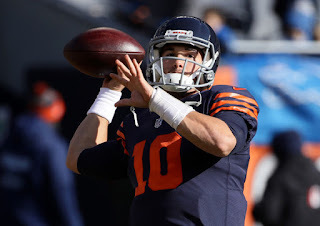 The Chicago Bears seem to have finally got past rebuild mode to compete mode, and it started with what appears to be a smart draft pick at the QB position. Mitch Trubisky is growing into the role of superstar QB, and he might have made a big leap on Sunday. Trubisky is leading the NFC North Division leaders to a 6-3 record, including an impressive victory over the Detroit Lions on Sunday. Trubisky accounted for four of the Bears TD's, 3 through the air and one with his legs. His 76.7% completion percentage and 355 yards were season highs as the Bears throttled the Lions 34-22. For the season, Trubisky is sporting a 19/7 TD to INT ratio, including 17-4 in his last six games. Huge games left with Minnesota (2) and Green Bay (at home) will decide the North, but Trubisky is finally reaching that point of being mentioned with the elite QBs. And is our Longhorndave Sportsman of the Week!